Opening times Galleries Tue–Sat 11am–6pm; Sun noon–6pm; closed Mon, but individual exhibitions may vary. General opening hours Mon–Sat 10am–midnight; Sun noon–midnight. Cinemaattic present a special programme of Basque Animation with Begoña Vicario and Izibene Oñederra, two of Spain's most prominent animators. Multi award-winning directors Begoña Vicario and Izibene Oñederra join us in person, and will guide us through their artistic world, looking at classic and contemporary animation made in the Basque Country. Great animators flourish in Basque Country, with artistic animation proposals that link animation with other contemporary arts. Vicario and Oñederra are considered two of the greatest animators not just in Spain, but internationally and their films have been shown in Annecy, Zagreb’s Animafest, Animac or San Sebastian Film Festival and as part of retrospectives in leading arts centres such as MoMA and CCCB . Experience a musical performance presented and created by disabled musicians, giving a dynamic glimpse into inclusive technology, composition and performance in the 21st century. Drake Music Scotland’s Digital Orchestra, which developed out of their Technophonia project in 2012, sees musicians pioneering innovative new ways of making music with laptops, iPads, digital synthesizers and wearable technology. In this performance, musicians from the orchestra will showcase a selection of this technology, which will be explored from multiple perspectives using live camera capture. You are invited to the official launch of DOCMA . Since November 2018 older members of the LGBTQI + community have been working with film artist Glenda Rome. They have explored what it means to be older, to be part of the community, what ‘care’ means to them and how they might make a film about it. Sign up for a 20-minute advice session to discuss any aspect of your project idea and application with Nicole Yip (Director, LUX Scotland) at the CCA , Glasgow. For those unable to get to the CCA , please see the sessions available via Skype on 7 May with Benjamin Cook (Director, LUX ). Seeking advice on your work, future projects or spaces to display? Attend a one-on-one session in Glasgow with artists Sharlene Bamboat and Alexis Mitchell. These one-hour sessions are for Scotland-based artists working with moving image and who are no longer in full-time education. These informal sessions are aimed at developing a wide-ranging dialogue around your practice, including discussing your work, exhibition possibilities, funding and production advice. Please note that priority will be given to artists who haven’t participated in a one-to-one session within the last six months. 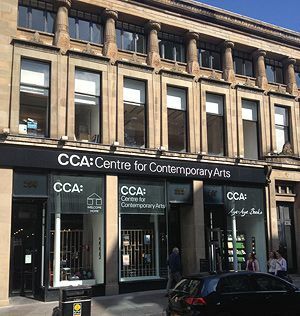 CCA is a direct descendant of the Third Eye Centre, Glasgow's avant-garde headquarters in the 70s and 80s. CCA commissions and presents new work by Scottish artists, as well as showing work by major international figures. A broad attitude to programming means that you'll also find dance performances, concerts, kids' acting workshops and a general emphasis on openness and inclusivity. Saramago café bar offers beers, wines, snacks and light meals.